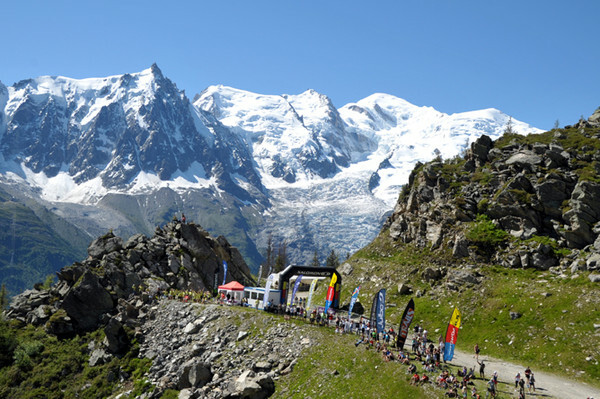 So last weekend I completed the Cross du Mont Blanc; a 23km race up and down the mountain trails of Chamonix, and I loved it! I’ve never done anything like that before and I was fairly apprehensive about how I would find it, but at the same time very excited to be involved in a big event with people from all over the World. It was nothing like the scale of the huge marathons with tens of thousands of competitors, but 1500 runners on single mountain trails only wide enough for 1 person feels like enough! I’ve never been a runner, never will be I don’t think! But I’ve discovered I much prefer trail running to classic road running. I love the varied nature of it, the ups, downs and the beautiful views, rather than the repetitive pounding. I’ve been training a lot over the last few months and always run with headphones in, lost in my own thoughts and those of the podcasts I listen to. I love the tranquility, the solitude and just simply being in nature. But despite this I have to say I got totally caught up in the buzz of the race and absolutely loved the whole atmosphere! From the exciting, mass start, the crowd cheering, the cowbells being rung throughout and just the sheer positivity and support of everyone from start to finish. It’s brilliant. I don’t think I’m going to become a regular racer, but I’ll definitely do another and I recommend it to all as an experience at least once! Mid way round, what a backdrop! Previous postFriday thought #38 The cool stuff you see when trail running! Next postFriday thought #40 Baseball in Montana!